NEW YORK, New York — In an effort to help address the issue of foot-traffic safety in the Armenian capitol, the Armenia Fund is building a pedestrian overpass at the crossing of Khanjyan and Tumanyan Streets, one of Yerevan’s busiest intersections. 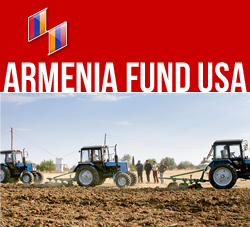 The project, which is being implemented jointly with the Yerevan Municipality, was sponsored by Armenia Fund USA (benefactor Hirair Hovnanian). To date, the foundation for the structure has been laid and currently crews are constructing the pillars. Two-and-a-half meters wide and twenty-five meters long, the overpass will feature ample lighting, gutters, and tiled floors, providing a safe means to navigate an area that is frequented by commuters and families alike. It is noteworthy that Hirair Hovnanian also sponsors the construction of an orphanage in Shushi, which is currently in its initial phases.